In his visits to Portland over the years, Corgan has sung in several quite different “cages.” At least one fan at Saturday night’s concert remembers the Pumpkins playing before a small crowd at the legendary club called Zootz. Undoubtedly, more remember the band at the Cumberland County Civic Center. Regardless, fans at the State Theatre were quickly reminded that this group represents an approach to playing to which the words big and loud easily attach. But also, lyrical seems to apply. Band members took the stage about 9:20 and quickly launched into the first song off their latest disc, “Oceania.” They then went on to play, in track order, the entire album. Occasionally augmented by some pre-recorded synthesizer arpeggios that called to mind some of the classic tunes by The Who, the quartet created songs of orchestral proportions. “Quasar” featured a Middle-Eastern feel with Corgan’s lyrics summoning otherworldly images. Strobe lights onstage and surreal-to-abstract videos projected on the State’s ceiling and walls added to quasi-psychedelic ambiance. 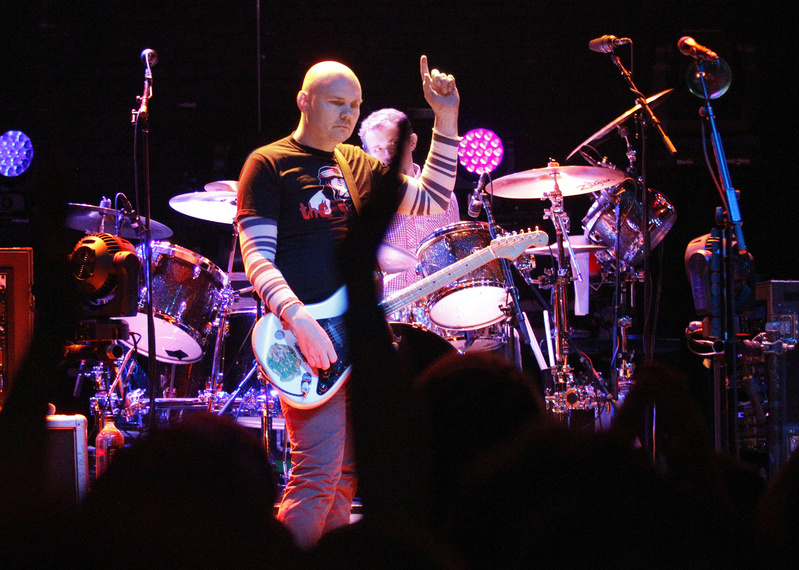 The 45-year-old Corgan is the only original member left in the band. But that’s no great drawback as the Pumpkins were always about his distinctive musical vision anyway. It’s a quirky and, arguably, romantic one with a strong feeling for the many avenues and possibilities available within various sub-genres of rock. Jeff Schroeder on guitar and keyboard, Nicole Fiorentino on bass and keyboard and Mike Byrne on drums fill out the quartet. “Pale Horse” featured Corgan’s lyrical side, with a plaintive “please comeback” leading to the close. The evening opened with a raucous set by a group from Tennessee called Five Knives. They initially seemed about perfect for a dance party on Mars but did show some potential – if only they would have turned it down a little.